NEXT SIZE 12 PINK V NECK T-SHIRT WITH SMALL STUD DETAIL NWOT. Dispatched with Royal Mail 2nd Class. Womens White Size 12 Petite Cotton T Shirt/top. Condition is New with tags. Dispatched with Royal Mail 1st Class. Next petite floral pink top with pretty detailed shoulders. 100% Cotton. Too Good To Go. 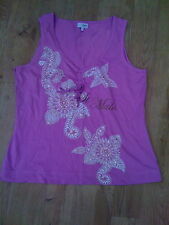 Next, Size 6 Petite Tank Top Style Top With Attached Blouse, Pink Colour. Condition is Used. Dispatched with Royal Mail 2nd Class. Condition is Used. Bu tt on s startpart way down front of blouse. L on g sleeves with do ub le button fastening& turn b ac k cu ff s. Purple and whitestripe w it h a ve ry t hi n si lv er s pa rk le running th ro ug h fabric. Ladies Top by Next size 18 Petite. 100% cotton RRP £26. 3/4 lengthsleeves with a frill detail edge. Single button fastening to back with a small drop eyelet. Round neckline with gathers to front. FOR SALE A NEXT CHARCOAL GREY TUNIC SHIRT SIZE 16 PETITE. THE LENGTH SHOULDER TO HEM IS 32". New listingNEXT SIZE 12(PETITE FIT) PALE MINT V NECK T-SHIRT WITH SMALL STUD DETAIL BNWT! NEXT SIZE 12 (PETITE FIT) PALE MINT V NECK T-SHIRT WITH SMALL STUD DETAIL BNWT!. Dispatched with Royal Mail 2nd Class. Next Petite Size 14 Denim Shirt Worn Once Excellent condition. Condition is Used. Dispatched with Royal Mail 2nd Class. Women's Next Petite Pale Blue Cotton Shirt Size 6. Condition is Used. Dispatched with Royal Mail 1st Class. Excellent condition as I've only worn it once as it looks too long on me being only 5ft. Only reason for selling. From clean smoke and pet free home. UK bids only. 3/4 Sleeve - Round Neck - Lace work on front - Tie Back - Machine Washable. Pit to pit 37" Length 23". Next petite stunning navy blue/white floral/leaf print stitch detail cap sleeve side hem tie top. Used, good condition. A NICE SHIRT IN VERY GOOD CONDITION SIZE 8 PETITE. Condition is Used. Pit to pit 20 ”. Collared necklinea nd button front st ar ts part way down front of blouse. 71 Cotton 25 Polyamide 4 Elastane. F ri ll front. Lovely 100% linen blouse from Next. Three quarter length sleeves with flounced cuffs, panel concealing button holes. Original price £32, so this is a bargain. Armpit to armpit 18". Back of neck to hem 20". NEXT 16 PETITE * STRIPE SHIRT * ROLL-TAB SLEEVES * WHITE BLUE * . Condition is Used. Dispatched with Royal Mail 1st Class. Women's Next Light Green Top - Size 12. Used, but in excellent condition. Mesh panel at front with stitch design. Thanks for looking, please check out my other items. 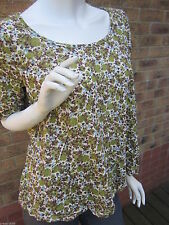 Next Petites Size 18 Top . Condition is Used. Dispatched with Royal Mail Signed For® 2nd Class. 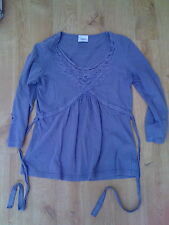 Lovely Next size 8 petite blue grey cotton mix T-shirt top. Very flattering style. Tie under the bust, ties at the back, and slight gathering under the bust for a flattering fit. Pretty silver stitching around the bib area, and also band of lace and matching silver stitching under the bust and on the back tie. SIZE 12 PETITE. 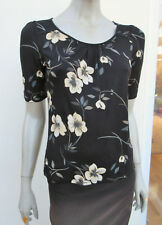 LOVELY GREY, WHITE & BLACK FLORAL, SHORT SLEEVE TOP BY NEXT. CAP SLEEVES. 100% COTTON. Lovely T shirt from Next petite range. Woven cotton with Broderie Anglaise front and sleeves. Back is cotton jersey. Neck label has been removed - see below. If you buy more than one item I will invoice you will total amount due. LADIES SLEEVELESS TOP. BLACK COLLAR BUTTON UP A BIT. BLACK, PINKS, ORANGES. Baby pink. pic 1 shows best colour match. In excellent condition. NEXT Grey Animal Print blouse. excellent like new condition. Ladies Next Top Size 12 Petite. Condition is Used. Dispatched with Royal Mail 2nd Class. Pi t to pit 17. 5 ”. Length 25 ”. F ab ul ou s littles hi ny r ed & s il ve r ed ge d buttons. 1 x b re as t pocket. Collared style with covered buttons. NEXT PETITE FLORAL SLEEVELESS SHIRT. Size UK 10 Petite. Sleeveless shirt from last season at Next - it was a very popular print and sold out straight away. High-low hem, with back split and tiny splits up the back (I didn't even notice these when I wore it!). Fabulous top from Next petite range in white with navy blue stripes. Cap sleeves with navy blue embroidery detail. In excellent condition as only worn once. Next Petite label was removed from neck - see below. Beautiful top either dress up or down. Size 12 Petite. Black Top With Cream Spots. Next Top/Blouse/T-Shirt. Bow Detail To Bust. Sizing Guide. ALL CLOTHING. A deduction may be made to cover the cost of the item if it is not received back in the condition it was sent. NON EU COUNTRIES. Austria, Belgium, Bulgaria, Croatia, Cyprus, Czech Republic, Denmark, Estonia Finland, France, Germany, Gibraltar, Greece, Hungary, Ireland, Italy, Latvia, Lithuania, Luxembourg, Malta,, Netherlands, Poland, Portugal, Romania, Slovakia, Slovenia, Spain, Sweden. NEXT PETITE. Black & Cream Star Sheer Top. Gathered neck and sleeves; Sheer cotton blend star pattern fabric with black chiffon tie detail. Tried on but never got around to wearing. Next petite beige shirt, size 6. Two pockets on the front with buttons. Button fastening down the front and on the sleeves. Ladies Top Pinkred floral print strappy cotton sleeveless womens blouse top.